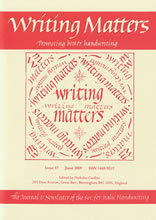 The Society for Italic Handwriting produces a quarterly magazine, called Writing Matters, which is sent to members. It contains a wealth of up-to-date information on pens, paper, writing equipment and other matters relating to the study and practice of this beautiful hand. A selection of advertisements, articles and covers is available to peruse, along with information about related publications. A small number of past Writing Matters issues (a complete year's worth) are available to download to give you an idea of what you will recieve (in hard copy) if you join. Please note that these PDF files are between 1.5Mb and 3Mb each. If you are unable to view these files, you may need to download and install Adobe Reader from the Adobe website. Back issues of the Society’s magazine Writing Matters are available at a cost of £1.50 each plus 75p p&p. Please check with the Secretary first which issues are available by emailing secretary@italic-handwriting.org.